Another CAT rating down, this one where you depart a Delta and get pick up radar services en route. I bonk on this one, running out of GoPro juice before arrival, but you’ll get the gist. Also note the nice stormy AS16/ASCA weather along the way. File this one under “flights I’d never make in real life.” Thanks for watching. Also, this “inside / out, outside /in” pattern of communication was a good way for me to think about the handoffs in ATC service when I was learning the airspace system (originally I found the rules of who to contact when and where a bit confusing). When departing you start with the controller closest to where you are – ground – and then progressively work your way out as your position changes (tower, then departure, then center). Coming in to a region or to land, you then work your way IN as your position changes (approach, then tower, then ground). One exception is clearance delivery, whom you contact before you start with ground if you’re filing an IFR clearance, or if you’re at a field that has a local clearance delivery (that will be on the chart). The CAT-04 flight is a good, simple example of these outside / in, inside / out handoffs: ground, tower, tower, ground. We don’t talk to a departure, center, or approach because we don’t have “radar services” (also called “flight following”), which is asking ATC to track you between towered fields as a safety measure, which is something they only do for VFR aircraft on request and if workload allows. “Picking up” flight following en route is the subject of the next CAT rating. So here’s the flight. It goes right according to plan until the very last second – and then the technology fates intervene! We do this flight in the Carenado C177 Cardinal over ORBX SoCal/Vector scenery and AS16 weather with REX textures. Thanks for watching. 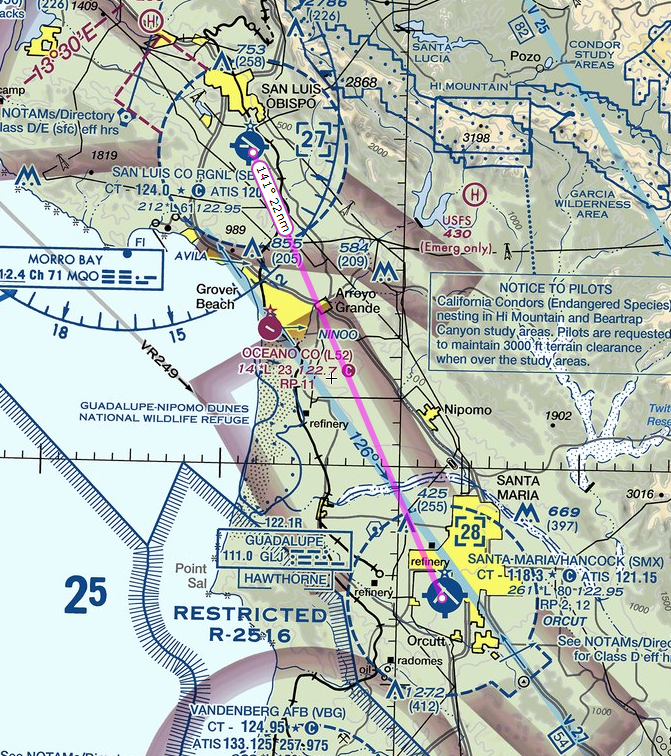 The PilotEdge Communication and Airspace Training ratings continue, this time with the CAT-03, which is three laps of the pattern at San Luis Obispo. I actually flew this twice. I forgot to hook up the mic to the GoPro in the first iteration, so I flew it again the next day to re-record the video. That flight involved its own set of interesting factors, not least of which was a hot mic on PilotEdge, which means I regaled the network with my narration for five or 10 minutes. Things happen, and I’m getting the stuck push-to-talk button on the Yoke fixed as a result. Nonetheless, here’s the flight video. I think it will be helpful to new PilotEdge flyers because it involves small variations on a standard pattern in each of the three laps (line up and wait, expedited landing, and an extended downwind). Thanks for watching. The CAT-2 rating on PilotEdge, which is a flight from a non-towered (New Cuyana) to a towered (San Luis, a Class Delta) field. And this time we have fun with temporary lost comms! Thanks for watching. PilotEdge has come out with yet another wonderful service for pilots and simmers: their new Communication and Airspace Training series of training ratings. These replace the “V” series of VFR ratings. There were three V ratings, and while excellent, the CAT ratings provide VFR fliers with a larger number of rating missions (11 rather than three) and a more gradual progression from introductory to advanced airspace and ATC skills. I hope to video all 11 ratings. The first is a flight between two non-towered fields, Oceana Co. and New Cuyana. In this VFR flight we learn basic CTAF call procedures for departure and landing. You may see the full description and set of briefing materials for the CAT-01 rating here.